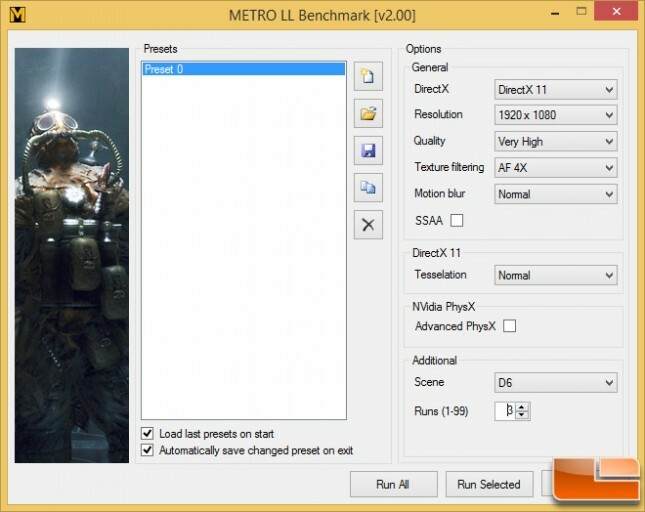 Benchmark Results: In Metro: Last Light with the NVIDIA GeForce GTX 780 Ti discrete desktop graphics card installed in the system we found a rather small difference between the Intel Core i7-4770K, 4790K and 5775C. 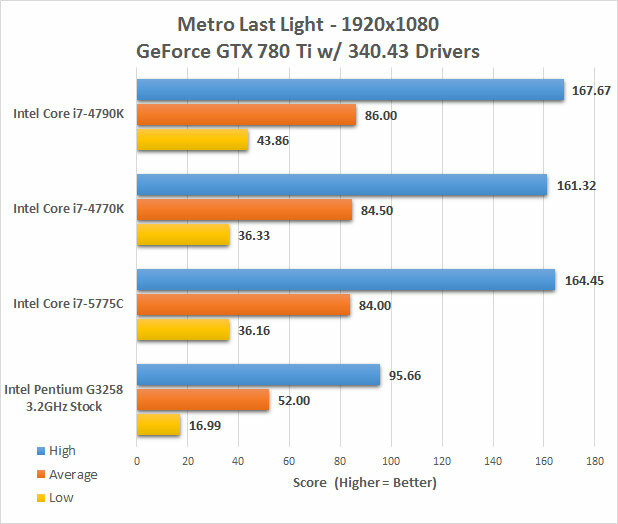 All were similar when it came to the average FPS, which is a good thing for the Core i7-5775C Broadwell processor as it has a base clock of 3.3GHz versus the 4.0GHz base clock on the 4790K. It looks like the Core i7-5775C is able to hang in game titles with the other big boy processors despite have a significantly lower base clock and less L3 cache. (6MB versus 8MB on the 4770K & 4790K). The one thing that might be really helping the Core i7-5775C keep up is the 128MB of eDRAM that it has! 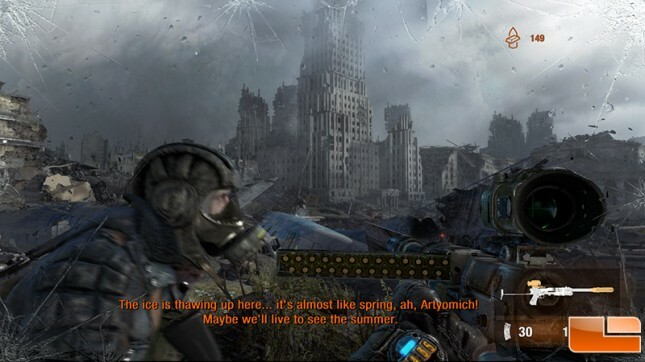 We’ll be looking at gaming performance more in-depth once we get a newer UEFI/BIOS version as the one we have now wouldn’t work with a discrete graphics card with the system being overclocked. Our platform wouldn’t post when overclocked with a discrete GPU installed, so we’ll have to save that testing for another day. 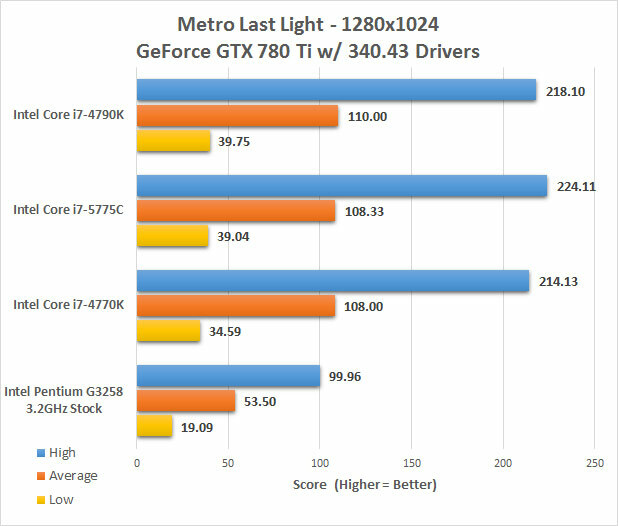 Benchmark Results: With the screen resolution bumped up to 1920×1080 we found that the average FPS dropped down to the mid 80’s, but the game was still playable as the minimum frame rate never dropped below 35 FPS on and of the quad-core processors. The differences between the Haswell and Broadwell processors is negligible at 1080P and we couldn’t tell a difference when gaming on the Core i7-5775C and Core i7-4790K on the handful of games we tried out with a discrete graphics card.